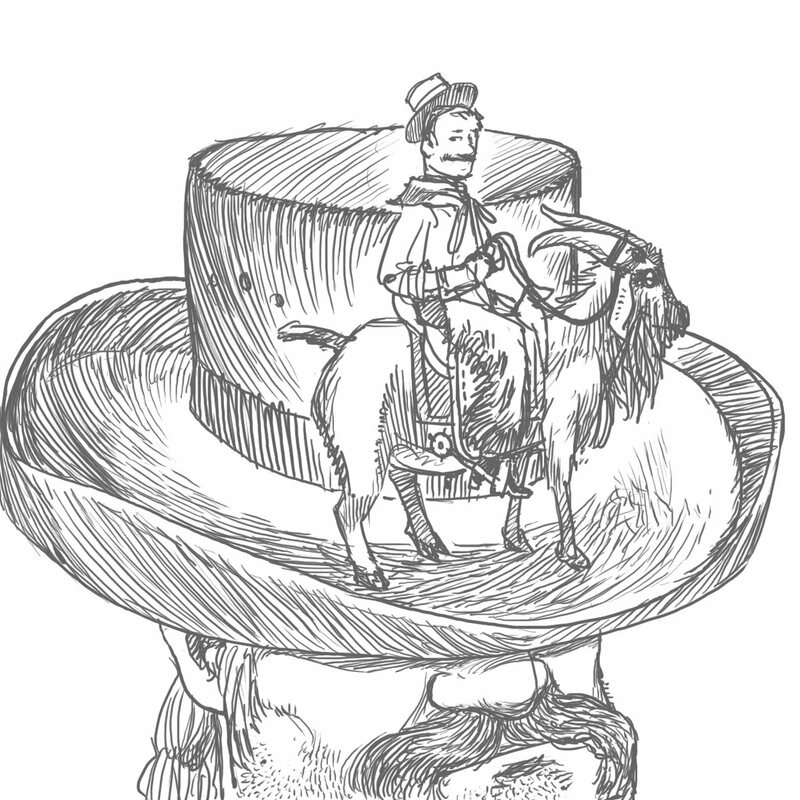 "a small man riding a large goat on the brim of a much larger man's cowboy hat." Anonymous, I will drawing that for you! Thanks for playing everyone. This was a good round! So many clever, funny ideas. GAMES! Send in your game-themed comments! Video game, board game, wild game--you name it! Games! See you Monday! Leprechauns playing tag through an abandoned amusement park. Chutes and ladders: the playground version. I like the lephrechaun one!! Bucking Ram... It's like the game "Ghost in the Graveyard." Jack Frost playing "Freeze Tag"
It's (just after) Easter, after all, so: a bunch of rabbits having an egg race. You know, the kind where you hold an egg in a spoon in your mouth and try not to drop it in your mad dash to the finish. What happens when all you can do is bounce? Two children in Candyland playing board games, while eating them. Two Eskimos bowling with a baby polar bear as the ball, and the pins are penguins. a super intense obstacle course between cats and dogs--and the prize is a golden easter egg! you can choose who is winning-are you a cat or a dog person??? Cole: Disc war games at the Tron arena. Link and Zelda having marriage problems (that would be awesome)! Would a scene from Kid Mercury count, since it was inspired by games? I’d like to see a heated chess game between two opposing coaches of NBA basketball teams in the middle of the court. The winner decides the outcome of a tied game. Anxious and sweaty players are being held back by referees from leaning over their couches shoulders, watching on with eager anticipation. The fans are on the edges of their seats craning their necks to see the outcome as the time clock ticks away for each of their moves. um. Apples playing bananagrams and bananas playing apples to apples. yes. Ada: kids having a water balloon fight.